When I was a child I loved reading about inventions and scientists. I devoured stories about them found in our Childcraft encyclopedia set. Last month at a library by the ocean I found a complete set someone had abandoned. I opened the box and was assaulted by the smell of mildew–not surprising for this part of San Francisco. Paging through them I was amazed at how many I remembered. The details came rushing back with a glance at an illustration. Like the creation of the sewing machine needle, “Elias exclaimed, ‘The dream gave me the answer! The hole has to be at the top! '” You won’t be surprised to learn I loved the story of the vulcanization of rubber. Now, as an adult I admire the skill of the storytellers to pull me in with the imagery and excitement of discovery and creation. I also realize they used myth making and artistic license. You’ve probably heard the horrific fights between Edison and Tesla to control power distribution or the forces that gather wanting to control new markets and disrupting inventions. Talking to him reminded me how much I like working with makers and creators and helping them tell their stories vs. railing against the finance industry’s fakers and takers. He told me about the 3D prototyping process using plastic then metal and all the testing they did to get just the right kind of durable blade. It’s very different designing something that can last for years or decades than for days or weeks. The idea of “give away the razor, sell the blades” has become shorthand for a certain kind of business model. It is described as common sense Economics 101. But common sense for whom? The company that “sells the blades,” not the end user. Of course there are benefits to the end user with lower up-front costs, but most people don’t think in terms of “total cost of ownership” and if they did, they might make other choices. I hope the product gets funded, it looks good and the greener solution makes a lot of sense to me, but I especially like the idea of subverting a wasteful, entrenched economic model with a more sustainable one. Especially a model whose external costs are literally hidden in landfills around the country. 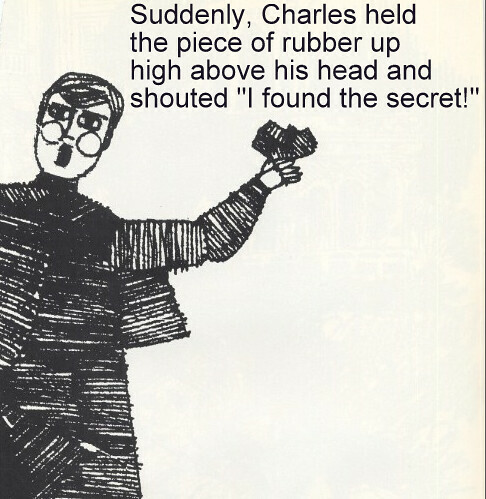 My friend the inventor didn’t have an epiphany like Charles Goodyear did when he figured out how to vulcanize rubber. But like him, he has created something new through a lot of hard work. My concern is what happens whenever anyone gets between a big company and their revenue stream. My guess is he’ll be ignored and dismissed by the big boys. They are busy adding a 6th blade to their razors. MBAs will dismiss the model because they can’t imagine a company in the razor business not hooking the people on a disposable product. But if enough people see that this makes sense and share his view, he might get a Childcraft Wikipedia entry in the future. Now, as an adult I admire the skill of the storytellers to pull me in with the imagery and excitement of discovery and creation. I also realize they used myth making and artistic license. You’ve probably heard the horrific fights between Edison and Tesla to control power distribution or the forces that gathered wanting to control new markets and disrupting inventions.